Disclosure: We will receive complimentary admission to the Volo Auto Museum in order to make an accurate review. No compensation was receive. All opinions are 100% our own. Have you visited the Volo Auto Museum yet? If you haven't or if you would like to return, we have a coupon for you! The coupon is good for $2 off of each adult admission up to 6 adults and is valid until 12/31/13. It is always nice to get a deal! some time. The Hollywood car collection sounds like it would be neat to see. My daughter will certainly love to see Lightning McQueen and who can resist the Mystery Machine? Of course, who could stop by without seeing the vintage cars? There is a lot to see! 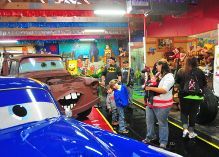 Volo Auto Museum is not just for car lovers or men, its fun for the whole family! The Museum covers 36 acres, mostly all indoors and includes fifty thousand square feet of antiques and gifts, a life like military combat zone, Betty's Diner featuring decor which includes Elvis Presley's autographed guitar, PeeWee Hermans Bicycle and more. Plus there are over 300 restored collector automobiles from the early teens through today. The Museum houses the largest collection of famous Hollywood TV and movie cars like the Batmobile, Ecto 1 from Ghostbusters and numerous others. New for 2013 is the Cars in Wonderland Exhibit; it has all your favorite childhood cars from the Scooby Doo Mystery Machine to Lightning McQueen and Tow Mater from CARS in an all surrounded by movie-like setting from your favorite Disney and Looney Tunes Cartoons such as Beauty and the Beast, Litter Mermaid, Coyote and Road Runner and others. Our readers can save up to $12 on admission with this coupon.